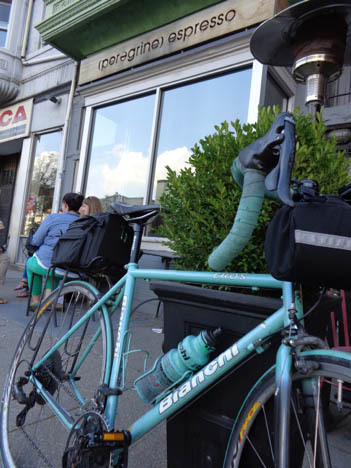 It’s Coffeeneuring Rewind Guest Post time, featuring Washington, D.C., locations and a Maryland coffeeneur! I hereby certify, under penalty of perjury, that the following seven submissions are authentic and are fully in compliance with the official 2013 Coffeneuring Rules and Regulations as set forth on the Chasing Mailboxes Web Site. Any challenges to the dates of the photographs can be fully supported by submission of screenshots from iPhoto showing the dates and times the pictures were taken. No performance enhancing drugs, blood doping, or other unfair competitive advantages were employed in completing these seven coffeneuring outings. Although I was a furloughed Fed as of the beginning of this writing on October 13, 2013, I decided to stick to the original weekend rules. 1. Baked & Wired, Georgetown, October 5, 2013. This was before the rains came and when it was unseasonably hot. Stopped on the way home on a 36-mile roundtrip from home to Old Town Alexandria, which also included a stop at Starbucks in Old Town, which does not count because only one coffee shop can count per day, because I had a cold, non-coffee/tea drink there, and because, well, it’s Starbucks. Drink at Baked & Wired: Doppio Macchiato. Although I am not the most authoritative source, I think Baked & Wired is as good as it gets on the coffee circuit in D.C.
2. 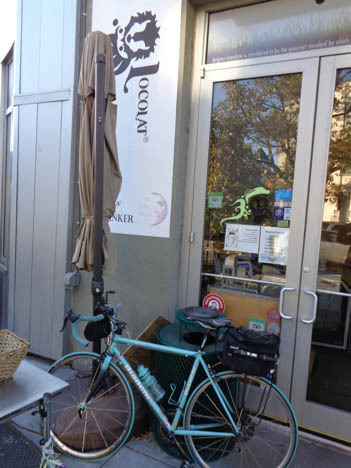 Peregrine Espresso, 14th Street, DC, October 6, 2013. Another hot day. Trip was about 23 miles, from home down to the Potomac, back and forth over the four Potomac bridges, and home up 14th Street then through the park from Adams Morgan. Drink at Peregrine Espresso: Doppio Macchiato. Also ran a few errands on the way home. 3. 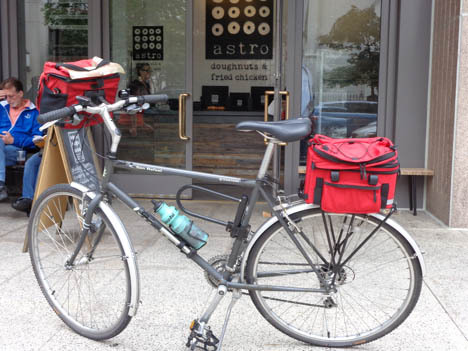 Astro Doughnuts & Fried Chicken, 1308 G Street, NW, October 12, 2013. The last of the rainy days for the week, as evidenced by the substitution of my newly refurbished 1999 Marin hybrid (rain bike) for my “real bike,” the Bianchi. Another 35-40 mile roundtrip to Old Town. 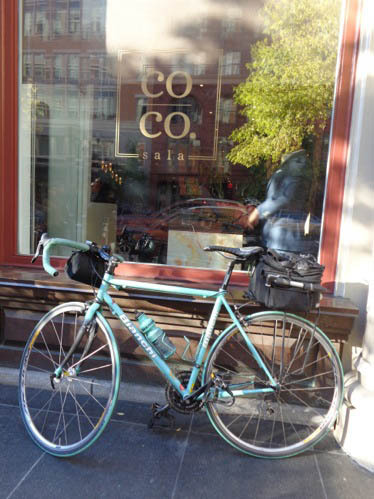 Also stopped at BicycleSPACE in D.C. for some advice/tweaks to the fit of the Marin. I am a new convert to BicycleSPACE (based on your suggestion, MG), and so far I am getting a good feeling about their operation. They also carry some Carradice bags, which I would think you will be interested to know. BicycleSPACE refused to take any money for the time spent with me, although I felt they did enough to warrant some payment. So that is a good sign and it creates some early loyalty from me, as does their generally helpful attitude and knowledge. Drink at Astro: Plain old coffee, that is all they have. The doughnuts are really awesome, however, and the fried chicken is quite good as well, so they can be forgiven their lack of attention to coffee. 4. 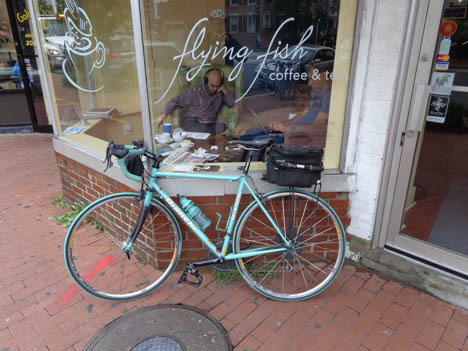 Flying Fish Coffee & Tea, Adams Morgan, October 13, 2013. Although the weather looked iffy, decided to go back to the Bianchi road bike today and, luckily, I did not get rained on. Late start due to family commitments, so just rode down to 14th Street Bridge and home, about 20 miles. Also spent time searching for a relatively light cable lock for the Marin. Bike shops seem down on them as inadequate security, but I want the convenience, generally don’t leave my bike for very long, and don’t consider the Marin a high risk for being stolen. Finally got the lock in a hardware store. Drink: Doppio Macchiato. Quite full-flavored and tasty. Friendly staff and environment. 5. 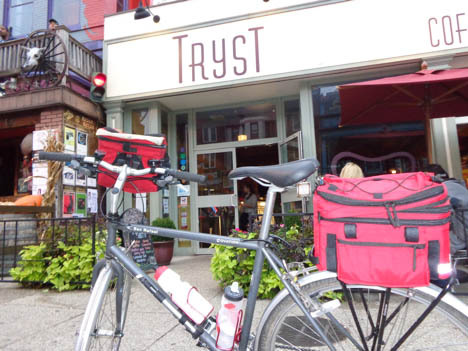 Tryst, Adams Morgan, October 19, 2013. Very late start in afternoon. 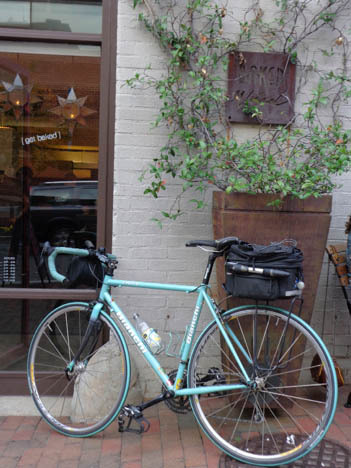 Had been threatening rain all day but hadn’t rained, so decided to go with Bianchi. Rode two miles and it started raining. Returned home to get Marin rain bike. When arrived home, of course, the rain had stopped and it never rained again. Drink at Tryst: Doppio Macchiato. Very good rich flavor. However, Tryst would not serve me at the coffee bar. Made me sit at a table and get waited on, saying it would deprive the servers of money if they didn’t make me sit and get waited on. Took way too long, especially on this day of getting such a late start. (I did leave the server a dollar, however.) Well, that takes Tryst permanently off of my list of biking coffee stops. I guess that deprives both the servers and Tryst of any more of my money. 6. Locolat Cafe, Adams Morgan, October 20, 2013. Came here for the hot chocolate which I heard was excellent. I had the milk chocolate. It was very good but no better than what I can make at home using Droste cocoa powder, sugar, and hot milk. As the weather gets colder I am going to be on a mission to find the best hot chocolate in the area; my own personal hot-chocolateneurring. This was my only destination for the day. Sixteen miles. 7. Coco Sala, 929 F St. NW, October 26, 2013. Heard they had great hot chocolate. Had many choices but I chose the “Chipotle,” which had a nice kick to it but not overwhelming. Would recommend but for the fact that this is a restaurant, not just a coffeeshop-type place, which means the hot chocolate cost over $6, plus tip. That pretty much crosses it off my regular list, but I have to admit I wouldn’t mind trying some of the other variations. And the bartender was very nice and informative. Rode about 23 miles from house to Potomac River bridges. Beautiful riding weather. Thank you, David, for completing the Coffeeneuring Challenge and for your restraint in not using any performance enhancing drugs during your rides! You went to some interesting destinations that I’ve added to my personal list to check out. Phew, lots of miles just for coffee or hot chocolate. What is this world coming to (wink)? But, seriously, my congratulations to your wonderful accomplishment, David, and well documented too. Pedal on.